When Is The Comic Book Show? 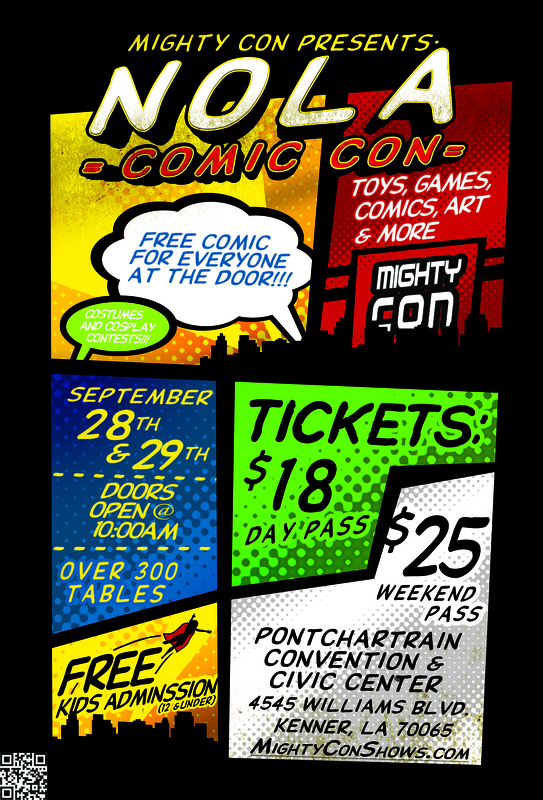 The New Orleans Comic Con takes place Saturday September 28th 10:00 a.m. to 6:00 p.m. and Sunday September 29th from 10:00 a.m. to 5:00 p.m.
Where is the Comic Book Show? How much is the Comic Book Show? Adults are just $18 for general admission one day passes, or save big money with a $25 weekend pass! And as always at Mighty Con shows kids 12 and under are FREE. But you don’t just get admission for that. Every person who attends Mighty Con gets a free comic book at the door to get their day started off right. Want to get in early? If you order your pass online, you can get in at 9:30 a.m., a half hour ahead of everyone else! Get first grab at all the best deals: click here to pre-order your passes! After pre-ordering, you can pick up your passes the morning of the show. Looking to Sell Your Collectibles Or Show Off Your Brand At Mighty Con? We do still have tables available, but act now as we will sell out quickly! See vendor/artist space availability here!. Don't forget to follow us on Facebook and/or email us at MightyConVendors@gmail.com for info on our next show and how to get you in! We’re always looking for new artists and vendors, so come on out! Keith Champagne is a writer/artist best known for his work with DC Comics on titles such as Superman, JSA, and Green Lantern. His creator-owned properties include The Mighty, The Switch (with Tom Nguyen) and Armor X. He likes Swedish Fish. Stone Aside Publishing is a publishing company owned and operated by Lee Stephen, author of the award-winning Epic novel series and audiobook line. We supply fans with fantasy and pop art of many fandoms. Sign up for the mighty con newsletter!